The introduction of the new SWI-CP2 represents a major shift in how technicians will install steering wheel control interfaces. Many installers associate steering wheel audio control connectivity solutions with frustration due to complicated installation and configuration procedures. PAC has set out to change that perception. The SWI-CP2 is the easiest to use interface we have ever created. Skeptical? Follow along and we’ll show you just how easy it is. You know the routine, the salesman walks into the install bay, drops a pile of gear of your workbench and hands you the keys the next job. You drive the client's brand new Nissan Juke into the bay and take the dash apart to install a new multimedia receiver. You see that the customer upgraded to steering wheel control retention. Pulling your smartphone from your pocket, you close Facebook and launch the ControlPRO app. First, you select SWI-CP2, then pick the make model and year of the vehicle. With a 2017 Nissan Juke selected, you choose the brand of radio then tap Next. Up pops the settings for the eight vehicle selection DIP switches and the four radio selection DIP switches. After flipping the DIP switches on the side of the SWI-CP2 you now know for certain that everything will work as soon it’s plugged in. Hitting Next in the app takes you to full-color wiring information including connector, wire and pin locations and colors. After completing the radio wiring with the BHA7552 vehicle harness, you plug in the BAA36 antenna adapter and mount the radio utilizing the BKNDK780 trim kit. With the radio and steering wheel controls working perfectly, you can now prepare to cram the 4-way 6x9s the salesman sold the client into the doors. Working with the new SWI-CP2 is as simple as we could make it. The DIP-switch settings and wire connections are all available on the website or the ControlPRO smartphone and tablet apps. We have included wire locations in the factory radio connector as well as the wire color to save you time. We even let you know how to connect the SWI-CP2 to the radio. You don’t need any cables or a computer to configure the SWI-CP2, so it works 24 hours a day, 7 days a week. The SWI-CP2 includes both analog and digital inputs. Digital connectivity works with CAN Bus, GMLAN, Class II, LIN Bus, and I Bus standards. 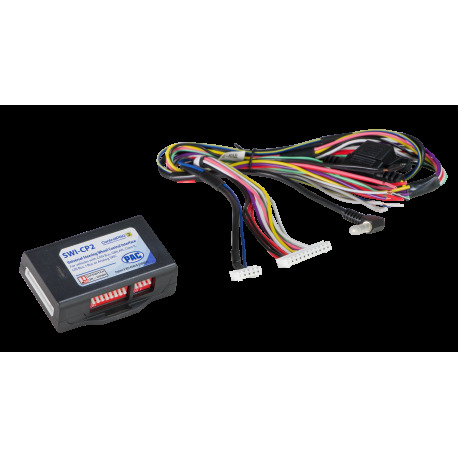 A 2 Amp 12-volt accessory output for data-bus controlled applications is also provided. If you want to reassign the steering wheel button functions, the web-based app includes a custom button mapping option. If you don’t have computer access, you can perform the function reassignment using a button on the SWI-CP2 and the LED on the top panel. If you haven’t already used the SWI-CP2, now is a great time to save yourself a few minutes on each installation and hours a week. Call your PAC sales representative and check one out.